FOR MEN Salon | Spa has been voted Best Men’s Haircut by Krista, Best Shave, Best Barber and a Top 200 Salon in America from 2008-2017. We are conveniently located off the 5 and 405 for your on-time appointment. Call to book your appointment 949-450-0150. Originally opened September 2004 as metro FOR MEN, m FOR MEN Salon | Spa is independently owned and operated by Men’s Master Hair Stylist, Krista Martin. 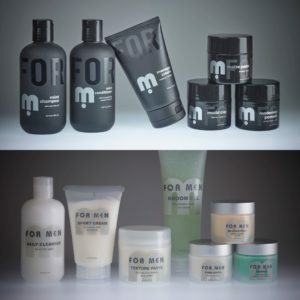 FOR MEN Salon | Spa is the premiere and only full-service men’s salon in Orange County, CA. We are a male-exclusive, masculine grooming environment where men get all of his hair, nail, skin and body care treatments. Reminiscence of a country club atmosphere. Why choose FOR MEN Salon | Spa? Because this men’a salon is different and is the only full service men’s hair salon in Orange County, CA. What makes this men’s salon different are the tools Krista uses, the products she chose and the passion she has for men’s hair and body grooming services. The tools she uses allow her to customize the desired outcome of our guests. The products she chose are formulated for men with their needs in mind because men’s skin and hair are different from women’s. FOR MEN Salon | Spa goes farther than the “just a men’s haircut”, Krista dives deep into theory and the why of what she does and what men really need.